Employment rose by 63,000 in September, driven by an increase in part-time employment. The unemployment rate declined 0.1 percentage points to 5.9%. 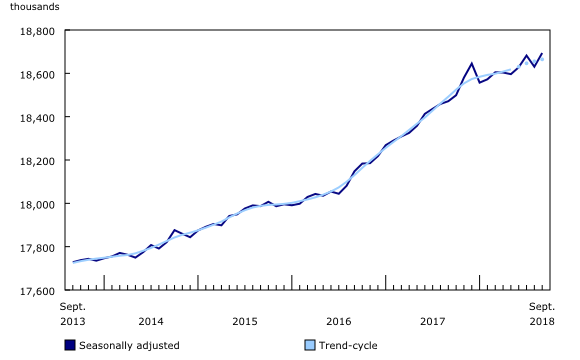 Compared with September 2017, employment was up 222,000 or 1.2%, entirely the result of gains in full-time work (+224,000). Over the same period, total hours worked increased 0.7%. In the third quarter, employment grew by 66,000 (+0.4%), following little change in the first and second quarters. Employment increased in Ontario and British Columbia while it was little changed in the remaining provinces. More people worked in construction; finance, insurance, real estate, rental and leasing; public administration; and agriculture. At the same time, employment fell in information, culture and recreation; and business, building and other support services. Employment increased for private sector employees while the number of public sector employees was little changed. The number of self-employed workers decreased. Employment increased for the core age population (aged 25 to 54) and held steady for the other demographic groups. In Ontario, employment increased by 36,000, the third increase in four months. Part-time employment rose by 39,000 while full-time employment was little changed. At the same time, the unemployment rate rose 0.2 percentage points to 5.9%. On a year-over-year basis, full-time employment grew by 103,000 and part-time employment was little changed. The level of part-time employment observed in September 2018 is consistent with typical seasonal patterns. On a seasonally unadjusted basis, declines in part-time employment usually observed in July occurred this year in August, resulting in offsetting movements in seasonally adjusted estimates for these months. Further analysis will be undertaken to identify the labour market conditions contributing to these trends. Employment in British Columbia increased by 33,000, driven by gains in full-time work (+26,000). In the third quarter, employment increased by 54,000, following a decline over the first half of 2018. Compared with 12 months earlier, employment rose by 43,000 (+1.7%). After increasing 0.7 percentage points over the first eight months of 2018, the unemployment rate fell 1.1 percentage points to 4.2% in September. 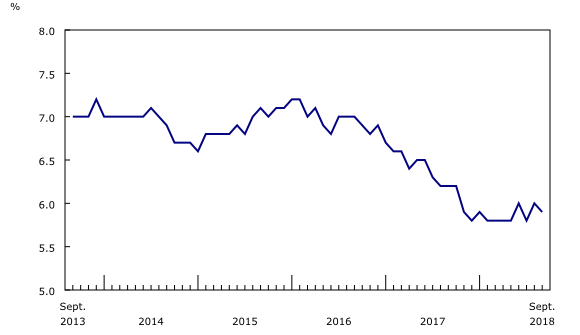 In Quebec, employment was little changed as declines in full-time work (-41,000) offset gains in part-time work (+33,000). The unemployment rate decreased 0.3 percentage points to 5.3%. On a year-over-year basis, employment was little changed. In the third quarter, employment in Nunavut increased by an estimated 500 compared with the second quarter. The unemployment rate was little changed. In Yukon, employment fell by an estimated 400 in the third quarter compared with the second quarter. The unemployment rate increased 0.9 percentage points to 3.2% and the employment rate fell 1.6 percentage points to 71.5%. Employment in the Northwest Territories increased by an estimated 900 in the third quarter compared with the second quarter. The unemployment rate fell by 3.9 percentage points to 4.7% as fewer people searched for work. In construction, employment rose by 28,000 in September, offsetting declines in the previous two months. Compared with September 2017, employment rose by 34,000 (+2.4%). In finance, insurance, real estate, rental and leasing, employment increased by 13,000, driven by gains in Ontario and Alberta. On a year-over-year basis, employment was little changed. Employment rose by 12,000 in public administration. Compared with a year earlier, employment increased by 20,000 (+2.1%) at the national level. There were 9,000 more people working in agriculture in September, following a downward trend from May to August. On a year-over-year basis, employment was little changed. In information, culture and recreation, employment decreased by 17,000, driven by declines in Quebec. In the 12 months to September, the number of workers in this industry was little changed at the national level. There were 10,000 fewer people working in business, building and other support services. On a year-over-year basis, employment was little changed. Employment rose by 96,000 among private sector employees in September, the first increase since November 2017. The number of public sector employees was little changed compared with August 2018. On a year-over-year basis, employment increased for both private (+147,000 or +1.2%) and public (+79,000 or +2.1%) sector employees. The number of self-employed workers fell by 35,000 in the month. Compared with 12 months earlier, employment among self-employed workers was little changed. Employment for people in the core-aged group (25 to 54) rose by 54,000 in September, driven by increases in part-time work (+46,000). Employment gains were recorded among both core-aged men (+34,000) and women (+20,000). The unemployment rate fell by 0.2 percentage points, to 5.1% for men and 5.0% for women. On a year-over-year basis, employment in this age group rose for both men (+80,000 or +1.3%) and women (+80,000 or +1.4%). The number of workers aged 55 and over was little changed in September following a decline in August. Their unemployment rate was little changed at 5.2%. Compared with September 2017, employment was up by 52,000 (+1.3%), with full-time employment increasing by 82,000 and part-time employment declining by 31,000. Employment for youth aged 15 to 24 was little changed as increases in part-time work (+38,000) were more than offset by decreases in full-time work (-44,000). Their unemployment rate was 11.0%. On a year-over-year basis, employment was little changed. The Labour Force Survey (LFS) estimates for September are for the week of September 9 to 15. The next release of the LFS will be on November 2. Labour Force Information (Catalogue number71-001-X), is now available for the week ending September 15. To enquire about the concepts, methods or data quality of this release, contact, Marton Lovei (613-240-3623; marton.lovei@canada.ca), Vincent Ferrao (613-951-4750; vincent.ferrao@canada.ca), or Client Services (toll-free: 1-866-873-8788; statcan.labour-travail.statcan@canada.ca), Labour Statistics Division.